"Nothing can travel faster than the speed of light." "Light always travels at the same speed." Have you heard these statements before? They are often quoted as results of Einstein's theory of relativity. Unfortunately, these statements are somewhat misleading. Let's add a few words to them to clarify. "Nothing can travel faster than the speed of light in a vacuum." "Light in a vacuum always travels at the same speed." Those additional three words in a vacuum are very important. A vacuum is a region with no matter in it. 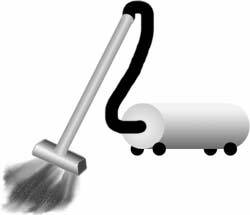 So a vacuum would not contain any dust particles (unlike a vacuum cleaner, which is generally full of dust particles). 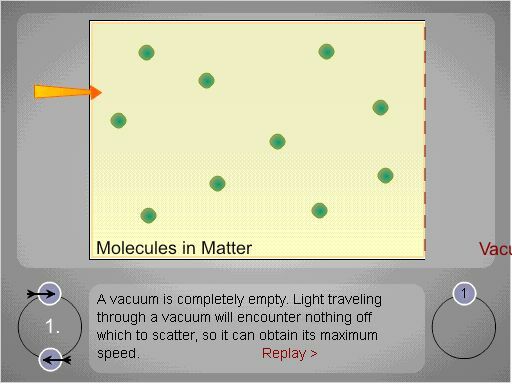 Light traveling through anything other than a perfect vacuum will scatter off off whatever particles exist, as illustrated below. This vacuum speed of light, c, is what the statements from relativity describe. Whenever light is in a vacuum, its speed has that exact value, no matter who measures it. Even if the vacuum is inside a box in a rocket traveling away from earth, both an astronaut in the rocket and a hypothetical observer on earth will measure the speed of light moving through that box to be exactly c. No one will measure a faster speed. Indeed, c is the ultimate speed limit of the universe. The index of refraction of some common materials are given below. The values of n depend somewhat on wavelength, but the dependence is not significant for most applications you will encounter in this course. Unless you are told otherwise, assume the index of refraction given you is appropriate for the wavelength of light you are considering. Those materials with large indices of refraction are called optically dense media. (A medium is just a fancy word for a type of material.) Materials with indices of refraction closer to one are called optically rare media. Being naturally lazy creatures, we generally drop the word "optical'' and talk about dense and rare materials. Just be careful not to confuse dense and rare in the optical context with mass density! Notice that the index of refraction of air differs from the index of refraction of vacuum by a very small amount. For applications with less than 5 digits of accuracy, the index of refraction of air is the same as that of vacuum, n= 1.000. You will probably not encounter a situation in which the differenc between air and vacuum matters, unless you plan a future in precise optics experimentation. Copyright © 1999 Rensselaer Polytechnic Institute and DJ Wagner. All Rights Reserved.